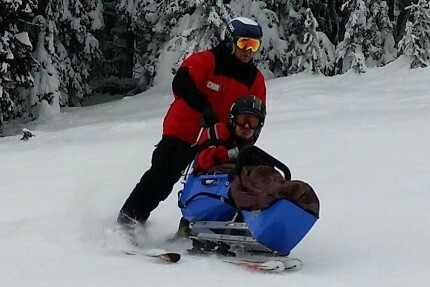 Silver Star Adaptive Snow Sports provides snow sport instruction to anyone who cannot be part of a regular ski lesson due to a mental or physical impairment of any type, or who needs a partner to assist during the ski day. To best serve the membership, SSASS offers lessons in five distinct Programs. SSASS programs are delivered by trained volunteers with CADS ( www.bcadaptive.com ) certifications. Some SSASS instructors are also CSIA certified. 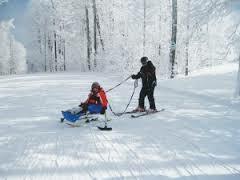 Generally, clients will be taught and escorted by two instructors during a lesson, using an adaptive technique to modify ski teaching to take advantage of and build on the abilities of the client. We operate through the entire ski season with the majority of our programs delivered from early January through late March. SSASS services are free of charge. Please book in advance. Our students range in age from 5 to very experienced adults. Age and previous skiing experience are not barriers. Our Visitors program (formerly known as our “out of town program”) is intended for visitors to the resort. We can provide a single lesson or a series of lessons depending on the length of the student’s stay and their ability. We recommend applying AT LEAST 2-3 weeks in advance to allow us time to schedule volunteer instructors. The more notice you can give the better. Visitor programs are available during the winter operating season for SilverStar resort. For more information contact info@ssass.bc.ca. Our weekly lessons program provides students the opportunity to participate in a regular series of lessons with the same instructor(s). Lessons are offered seven days a week. The program provides eight lessons, once a week, and starts in early January. For more information contact info@ssass.bc.ca. Our Discovery Program provides an opportunity for students to “try out” adaptive snowsports for the first time during the night skiing season at the resort on Friday evenings. Lessons typically start at 4:30 or 5:00 pm. For those in need, SSASS can subsidize the cost of lift tickets & equipment rentals for a one-time lesson. For more information contact info@ssass.bc.ca. The SSASS race program is a more challenging program for SSASS students with intermediate skiing, sit-ski or boarding skills who are looking for coaching and challenge. The program helps students to develop advanced alpine techniques using adaptive methods and focuses on building student independence on the mountain using a race program format. Weekly Sunday training sessions at SilverStar Resort operate from Jan to April. The program is all day with 2 hr sessions on the mountain in both the morning and the afternoon. Attendance at local race events and the BC Adaptive Snowsports “Building our Best” camps and races at ski hills across the province. If you can ski unassisted on intermediate (blue) runs, have the stamina to ski for 4+ hours a day and want to improve your skiing, we would love to hear from you. For more information contact info@ssass.bc.ca. When your school has a ski day, no one should be left behind. Contact our school group coordinator to assign one on one, or two on one instruction for any students with special needs. For more information contact info@ssass.bc.ca.